The first monthly series dedicated to the discussion and exploration of various themes in Performance Art, closes this year’s presentations with the program Performance and Consumption. December’s conversation features artists whose work allude, reference, investigate, and explore consumption as performative socio-political postures. The presentation of documentation of works will be followed by a panel conversation and Q&A with attending audience. Selected artists will present their live performances on Sunday, December 18, 8pm at JACK in Brooklyn. Participating Artists: Ali Asgar (Bangladesh), Anya Liftig (United States), Gian Luigi Biagini (Italy/Finland), and Quinn Dukes (United States). Ali Asgar is an artist from Bangladesh who focuses primarily on body and space as a main element of practice. Ali’s work surrounding gender, sexuality, and social taboos often reflects upon personal struggles with the conservative Bangladeshi attitude towards members of LGBTQ communities. Asgar uses the body and self-imagery as a rudimentary element to walk the line between reality and the artifice of self-analysis. Ali’s artwork is reflective to past & present experiences in a very different social, cultural, political, and educational environment. Ali is currently in the US as an Artist Protection Fund Fellow in residence at the University of Maine, continuing politically inspired projects that emphasize trauma, dislocation, isolation, body politics and queer identity. With a BFA in Printmaking from the Faculty of Fine Arts from the University of Dhaka, Ali has participated in major group exhibitions including the Dhaka Art Summit in 2016 and 2014, the Kolkata International Performance Festival in 2016, the Dhaka Social Art Festival in 2014, SEA Juried Art Show (Lislie) in Chicago in 2014, 15 Asian Art Biennale in 2013 among many others. Ali recently completed a solo performance project entitled Shameless at the Edward M. Kennedy Center (EMK) this past year (2016) in Dhaka, Bangladesh. Anya Liftig is a writer and performer. Her work has been featured at TATE Modern, MOMA, CPR, Highways Performance Space, Lapsody4 Finland, Fado Toronto, Performance Art Institute-San Francisco, Atlanta Contemporary Art Center, The Kitchen at the Independent Art Fair, Performer Stammtisch Berlin, OVADA, Joyce Soho and many other venues. In “The Anxiety of Influence” she dressed exactly like Marina Abramovic and sat across from her all day during “The Artist is Present” exhibition. Her work has been published and written about in The New York Times Magazine, BOMB, The Wall Street Journal, Vogue Italia, Next Magazine, Now and Then, Stay Thirsty, New York Magazine, Gothamist, Jezebel, Hyperallergic, Bad at Sports, The Other Journal, and many others. 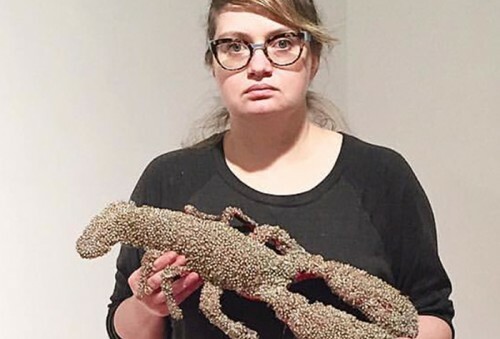 She is a graduate of Yale University and Georgia State University and has received grant and residency support from The MacDowell Colony, Yaddo, Atlantic Center for the Arts, The New Museum, Mertz Gilmore Foundation, Flux Projects, University of Antioquia and Casa Tres Patios-Medellin, Colombia. Gian Luigi Biagini was born in Italy, and currently lives in Helsinki, where he is doctoral student in Aalto University School of Art, Design and Architecture. He has experimented with many media but now he defines himself as ANARTIST (Anarchist Artist) and describes his praxis as DISTURBANISM (Disturb and Urbanism). Since he moved to Helsinki 5 years, he started doing interventions in the urban space to disturb the capitalist organization of space-time . The urban everyday is the field of battle of his war-machines that subtract the organization of the space-time and unleashes the becoming of an autonomous event. His actions are like urban sacrifices inspired to the Urban Riot that he sees as the repetition – with a disguised “mask” – of ancient rituals of expenditure and transgression. He feels his actions are driven by the rebellion of the flesh to the abstraction of urban space, to the discipline imposed in its organization and to the axiomatic of exchange value inscribed in it: all processes for molding a “docile body”. 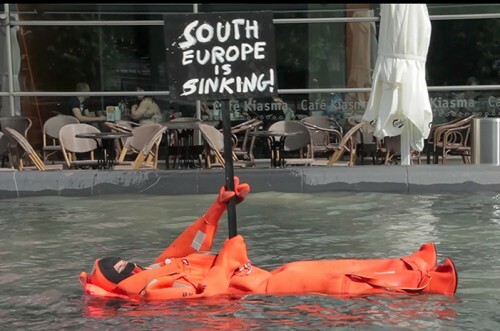 He has been performing Disturbanist Actions in Helsinki, Amsterdam, Marrakech, Berlin, Venice, Pittsburgh, Novi Sad and now in New York. He has given courses and lectures in Aalto University (Helsinki) and in the Art Academy of Latvia (Riga). 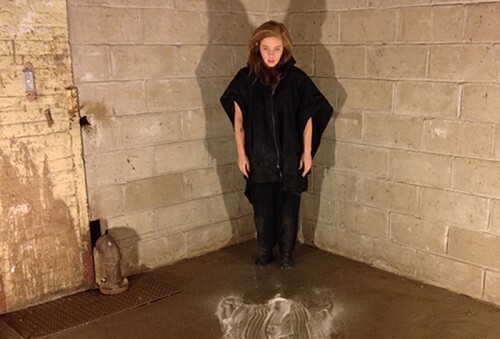 Quinn Dukes is a multimedia performance artist, activist and curator based in Brooklyn, NY. She typically presents durational performance projects addressing environmental disasters, social injustice, ritual and the human condition. In 2014, following a heated discussion about the death of performance art, Dukes founded Performance Is Alive. She is a tireless advocate for performance art and higher education via appointments at Grace Exhibition Space (Brooklyn) and the School of Visual Arts (NYC). Hector Canonge (creator of TALKaCTIVE) is an interdisciplinary artist, curator, media educator and cultural entrepreneur based in New York City. His work incorporates the use of new media technologies, cinematic narratives, Live Action Art, and Social Practice to explore and treat issues related to constructions of identity, gender roles, psychogeography, and the politics of migration. He has exhibited and presented broadly in the United States, Latin America, Europe and Asia. As cultural entrepreneur, Canonge created and directs the annual festival ITINERANT, started the projects: ARTerial Performance Lab (APLAB), an initiative to foster collaboration among performance artists from the Americas, PERFORMEANDO, a program that focuses on featuring Hispanic performance artists living in the USA, NEXUSURNEXUS a virtual platform for Live Action Art, and PERFORMAXIS, an international residency program in collaboration with galleries and art spaces in Latin America. After living abroad for almost 3 years, Canonge returned to the USA in late 2015 to continue with his projects, exhibitions, and presentations: TALKaCTIVE, performance art series, CONVIVIR, international residency program at his new space, MODULO 715 in Jackson Heights, QUeens, and LiVEART.US. The artist is currently at work in his new project “LABoRAL,” funded by Frankin Furnace Award, to be presented on December 20, at Glasshouse Project in NYC. 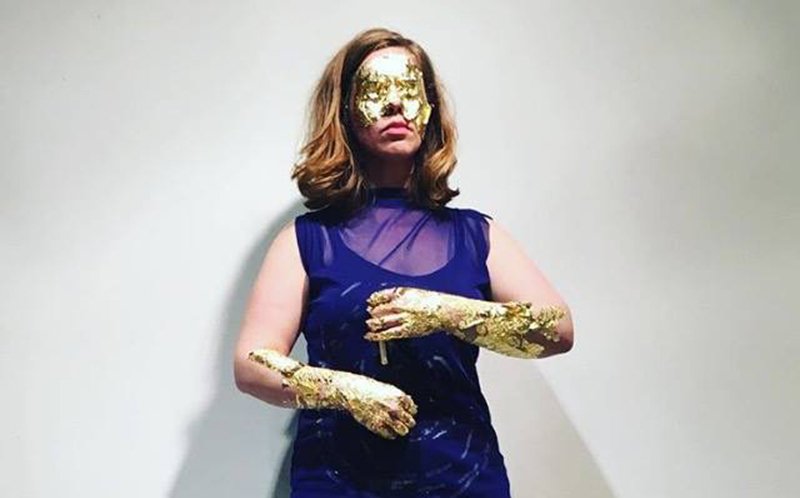 TALKaCTIVE: perfomance art conversation series- is a new program that fosters dialogue and exchange among Live Action Art practitioners, encourages commentary about Performance Art, and prompts reflection about performative processes, methodologies, and styles. Every session is organized around a relevant topic in Performance Art, and the presentation of works by a group of selected artists who share their work, discuss their approach to Live Art, and engage in open conversation with critics, curators, and attending audience. The monthly series consists of a presentation, panel, and open Q&A session where participating artists screen documentation of their work, a curator or critic contextualizes the works presented, and a moderator mediates the exchange of information and resources. TALKaCTIVE is an independent initiative created and organized by artist Hector Canonge. Hosted at the Queens Museum, the monthly series is free of charge and open to the general public.